It’s the time of year when the goblins and ghouls start to emerge in the New Lenox area, on a mission to see how full they can get their candy bags. 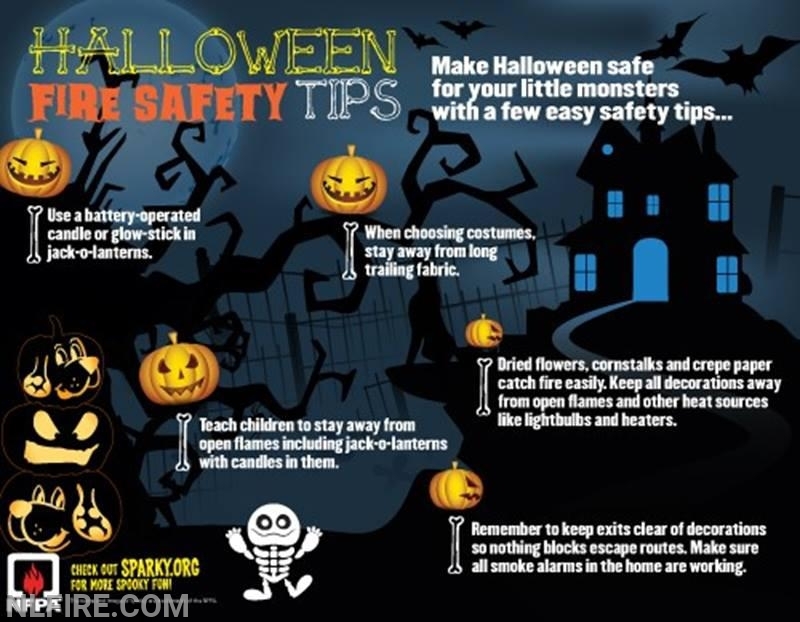 Although Halloween is a fun and spooky time of year for kids, make trick-or-treating safe for the little monsters with a few easy safety tips. •	When choosing a costume, stay away from billowing or long trailing fabric. If your child is wearing a mask, make sure the eye holes are large enough so they can see out. •	Provide children with flashlights to carry for lighting or glow sticks as part of their costume. •	It is safest to use a flashlight or battery-operated candle in a jack-o-lantern. If you use a real candle, use extreme caution. Make sure children are watched at all times when candles are lit. When lighting candles inside jack-o-lanterns, use long, fireplace-style matches or a utility lighter. Be sure to place lit pumpkins well away from anything that can burn and far enough out of way of trick-or-treaters, doorsteps, walkways and yards. •	Dried cornstalks, flowers and crepe paper are highly flammable. Keep these and other decorations well away from all open flames and heat sources, including light bulbs, and heaters. •	Remember to keep exits clear of decorations, so nothing blocks escape routes. •	Use flashlights as alternatives to candles or torch lights when decorating walkways and yards. They are much safer for trick-or-treaters, whose costumes may brush against the lighting. •	If your children are going to Halloween parties at others’ homes, have them look for ways out of the home and plan how they would get out in an emergency.